Siemens has expanded its popular Simatic WinCC SCADA software into a plant-wide information system. Available globally to acquire, visualize and analyze production data, WinCC Version 7.2 now also offers new information server options and simplifies complex production operations with multi-touch operator inputs. 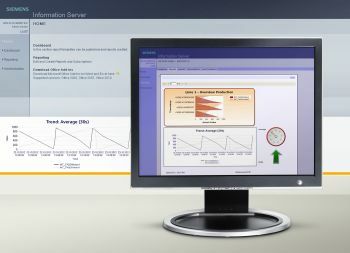 New Simatic Process Historian and Simatic Information Server options offer scalable long-term process data archiving and Web-based analysis and reporting tools. Both options include plant-wide analysis and reports to optimize production processes. Version 7.2 easily adapts to large systems with up to 18 optionally redundant servers. An archiving function automatically creates weekly, monthly and annual records. Process, consumption counter and manual entry values can be recorded, analyzed and archived. WinCC 7.2 supports the Unicode data format and multiple languages for global applications. Two-finger, multi-touch gestures simplify zooming, sweeping and rotating images on consumer operator interfaces. Designed to make complex production plant operations more intuitive, set point inputs are also available. For heightened safety, the multi-touch function requires two-handed operations to protect against unintentional switching operations.